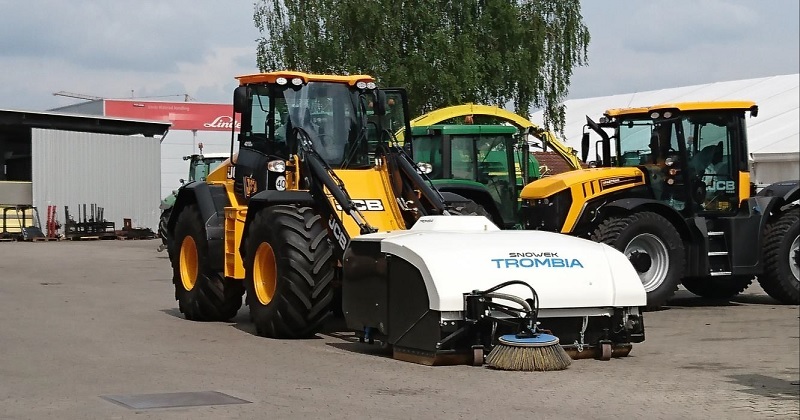 Finnish road maintenance innovator Snowek Oy has received the European Union PM10 street dust certification for its flagship innovation, waterless street sweeper attachment Trombia. This makes the Finnish solution the first waterless sweeper attachment to be able to reach the highest standard of the street cleaning requirements around the world. In the PM10 test, Trombia was granted the maximum three stars. Finnish road maintenance developer Snowek has for 3.5 years researched and a feasible solution for worldwide street sweeping without the use of dust-binding water on cleaning surfaces. The widely accepted current methods are utilizing large quantities of water for dust binding, which makes the surfaces into a sticky mud and thus inefficient to sweep. When the surfaces dry up, the dust rises again on the surrounding air. Snowek’s Trombia technology uses a globally patent-pending solution for sweeping the dust on fully dry surfaces. Trombia enhances the cleaning result by adding an efficient air-knife technology to remove dust and debris as well an organic vacuum created by the rotation force of the sweeper roller and the air knife fan. Contradictory to all existing solutions the method also uses a cyclone in a fully closed hopper environment to keep dust out of the surrounding air. When operating on a dry surface, Trombia delivers the most efficient cleaning result for fine PM10 and PM2.5 particles. Snowek marketing manager Antti Nikkanen said: "We launched the prototypes last year and our customer swept approximately 700 hours during the spring sweeping season around Finland. After the season we continued the fine tuning the technology with an aim to reach the EUnited PM10 certficate in the spring. This spring we also introduced the 2017 models to several cities in Finland, got the final round of demanding customer feedback and are now finally ready to start exporting. The main commercial launch will be staged at Maxpo 2017 machinery expo." The EUnited PM test has been the unquestionable European reference for the assessment of the fine particulate behaviour of road sweepers for several years. With the publication of DIN EN 15429-3: 2015-05: Sweepers – Part 3: ‘Capacity of dust – testing and assessment’ in May 2015, the EUnited PM Assessment became a recognized standard in Europe. Fine particles have become a serious threat to the residents in many cities. Through the European Air Quality Directive 2008/50/EC, cities and municipalities must ensure that emission limit values for fine particles are only exceeded on a limited number of days per year. Improving air quality has become a daily challenge for the local authorities and the use of sweepers to curb the amount of dust in public areas is common practice. Nikkanen added: "Waterless cleaning process is the key for truly successful and efficient sweeping. We see that all methods using water to bind dust on street surfaces require enormous energy and powered vacuum to sweep clean, our Trombia technology focuses to solve this global challenge. Also saving water is important in all global industries going forward. At the moment, Trombia technology is available for wheel loader and tractor mounted attachment products that use only the hydraulic power from the base vehicle." Finland is one of the toughest street sweeping markets due to the increasing amount of gritting sand spreading in the winter time. After the winter season all gritting sand shall be collected with rapid speed to avoid street dust issues rising from the traffic. Nikkanen added: "Trombia cleaning method is a unique way to lower the investments for cities and contractors to allow more efficient sweeping season. Wheel loaders and tractors are widely used for winter snow plowing and thus, they can now be turned into a serious high-end sweeping units."